According to PMI’s Pulse of the Profession report from 2014, high-performing organizations complete 89% of their planned projects, while low-performing organizations complete only 36% of their planned projects. What is the difference between a high-performing organization and a low-performing one? In many cases, it’s effective project management. To keep your business on task and performing at its highest level, project management led by qualified managers is key. Read about project management steps and see how Lucidchart can help you map out that process for better understanding and implementation. Project management is a mixture of art and science. It requires essential soft skills including leadership, problem-solving, and trust-building, as well as detail-oriented hard skills that include number-crunching, risk management, and team bandwidth oversight. Project managers in today’s business climate should also be well versed in project management software to visualize projects. As you develop software, design websites, create marketing campaigns, or initiate and complete projects of any type, clear and accurate project management makes a huge difference. Follow the five essential project management steps below and improve your organization’s performance and project completion percentage by leaps and bounds. In this phase, members of the organization come up with an idea for a project. Some organizations hold brainstorming sessions to come up with ideas, while others employ professionals whose entire role revolves around ideation. As your company thinks about solutions to common pain points, try capturing those ideas in a mind map. 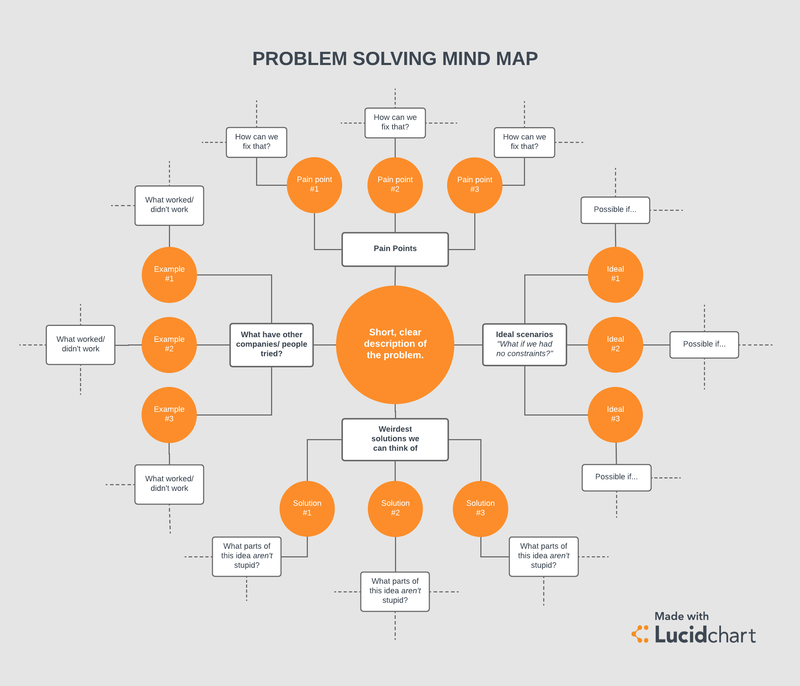 Lucidchart offers a mind map template to get you started, and you can easily share that diagram as you seek feedback from others. Use this problem solving template in your project management process. However your company handles this portion of the process, stay involved in this process to keep the ideation on track. Make sure ideas are feasible for the organization to achieve and, once an idea is finalized, move the project on to the initiation phase. Once your organization has a general idea of the project, meet with key stakeholders within the organization. In this phase, stakeholders further evaluate the project and make a decision on whether to go forward. Conduct further research to form a high-level risk assessment and scope for the project, including an estimate of the work to be performed. During the initiation phase, you should begin building a project plan, which will be a living document that grows as the project becomes more detailed in later phases. In this phase, you should set defined goals for the project—what the project deliverables are, what the project is designed to achieve, and what the project’s measurable benefit for the company will be. There are two main philosophies for setting these defined goals. Both work well—choose based on which fits more with your organization’s structure and culture. The development of SMART Goals is the result of a management strategy called Management by Objectives (MBO). SMART stands for Specific, Measurable, Achievable, Realistic, and Time-Based—all the factors that go into a defined project goal. Specific: Describe in detail the desired result of the project. For example, if you began an email marketing campaign, a broad goal may be something like “Increase customer engagement.” A specific goal would be “Increase email open rate by 10%.” The specific goal gives you a target to shoot for and helps with the next criterion. Measurable: The success or failure of your project should be quantifiable. It should also take into account the tools you have at hand to measure success. If you do not have the analytics capabilities to determine the success of your campaign, your goal is not measurable. For the goal of increasing email open rate by 10%, you must have tracking in place to make that a measurable goal. Achievable: If you set unachievable goals for your organization, you’ll never meet them. Take our example email marketing campaign: wanting customers to open 100% of your marketing emails is not an achievable goal when you currently have a 5% open rate for marketing emails. A small increase in your open rate, like 10%, is achievable. Realistic: Achievable goals are also realistic. Realistic goals should be challenging but possible to meet. More recently, in order to keep up with more agile business environments, entrepreneur Adam Kreek proposed a new set of measurements for defined goals: the CLEAR method. CLEAR stands for Collaborative, Limited, Emotional, Appreciable, and Refinable. Collaborative: In this philosophy, goals should allow teams to work together to achieve project success. Limited: Similar to the aspects of measurability, achievability, and time-based criteria in SMART goals, this aspect of CLEAR goals maintains that goals should be limited in both scope and time so that they can be realistically achieved and measured. Emotional: Here is where the CLEAR method really differs from the SMART method. Goals should have an emotional appeal for team members so that they stay passionate about completing their portions of the project. Appreciable: Larger goals should be broken down into smaller ones so that team members can work concurrently and quickly. Refinable: For today’s agile work environment, you should be able to adjust your goals on the fly if need be. Both SMART and CLEAR goals have their place—you’ll know what’s best for your particular organization. Baseline management plans: Describes the review process, as well as contingencies for making up lost time if certain portions of the project are behind schedule. Staffing plans: Shows which team members are needed to complete the project and how much of their allotted work hours can be devoted to this particular project. Quality and risk assessment: Takes into account any potential roadblocks for the project and how to deal with them while maintaining a high quality of work. 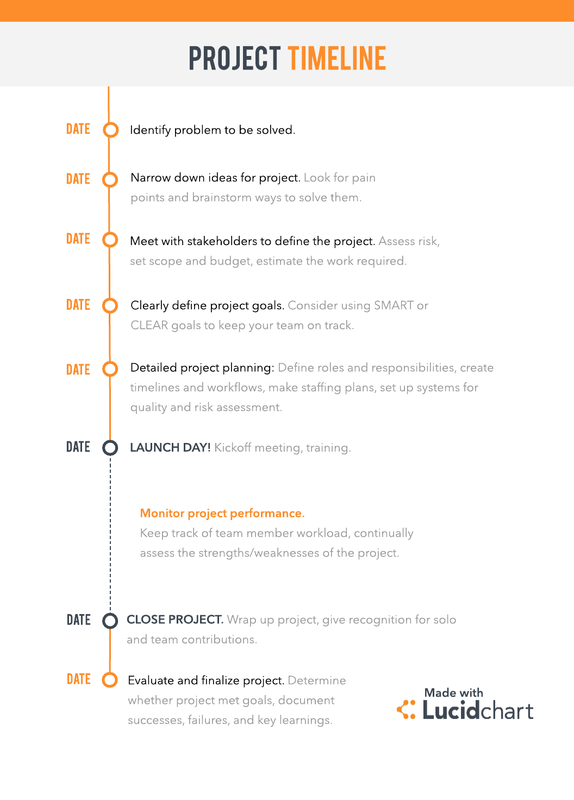 Use this project timeline template in your project management process. For this particular portion of the project, visualization and workflow software is essential both for keeping projects on schedule and giving key stakeholders a representation of how the project will be achieved. For example, creating plans in Lucidchart saves project managers and process engineers an average of 10 hours a week, giving them more time to troubleshoot and handle the day-to-day minutiae of managing the project to completion. The launch phase is where the larger functional team comes in. The work you’ve accomplished in earlier steps should make it easier for team members to do their jobs quickly, efficiently, and passionately. The launch phase often begins with a kickoff meeting discussing the goals of the project, as well as each team member's role and tasks. Remember, as you explain this process, that you are unloading a bunch of new information on your team members. Make that information as easy to digest as possible. We’re not talking about a 500-word email that details every step of the process—when you create a visual that goes through the various steps of a process, team members can understand their tasks at a glance and have something to quickly refresh their memories while they’re in the middle of their work. Use this template to show team responsibilities and project management steps. Make sure team members are set up to stay on task and on schedule. Swimlane diagrams could help your team members understand their roles in the bigger picture and hold themselves accountable. "Even processes that look like they are working can be inefficient, and stripping out 'waste' from processes is one of the key principles behind lean management." So keep going—the remaining steps of project management are just as essential. At this stage, you should monitor the performance of the team as they complete their tasks. In order to properly track performance, it is essential for that performance to be as measurable as the goals of the overall project. That’s where Key Performance Indicators (KPIs) come in. These are some common Key Performance Indicators for the completion of a large project. Timeliness: Are tasks completed on time? Accuracy: Are tasks completed to the proper specifications? Quality: Do deliverables live up to your organization’s standards? Cost: Is the project still on budget? In the control phase, organize the disparate deliverables and make sure the project is completed to the satisfaction of key stakeholders. This stage may include quality assurance testing. For projects that require ongoing activity, create a process to continually measure the success of the project based on SMART or CLEAR goals. "Processes that aren't working well can be spotted because they cause confusion and delay. Processes are there to help streamline the work, make repetitive tasks easier and provide everything required to the people who work on the next step, whatever that happens to be." Solidifying and optimizing the processes that support the execution of your project is clearly vital for long-term success. The close of a project may come weeks, months, or even years after the completion of the deliverables by team members. For a web design firm, the close of a project can be as simple as a delivery of the completed website to a client, but for a marketing firm or software development company, you may not be able to measure success until much further down the road. Perhaps the most important part of the closing phase is to evaluate the success of the project. Did it meet its measurable goals? If so, how can you replicate that success in other projects? If not, how can you and your team avoid those pitfalls next time? Only after full evaluation can a project finally be put to bed. Lucidchart, the essential visual productivity platform, works anywhere that you do and can help you accomplish any responsibility on your plate as a process engineer or project manager. On average, Lucidchart makes operations professionals 37% more efficient at improving processes and 34% more productive overall. That added productivity can save an organization up to $20,000 per year. 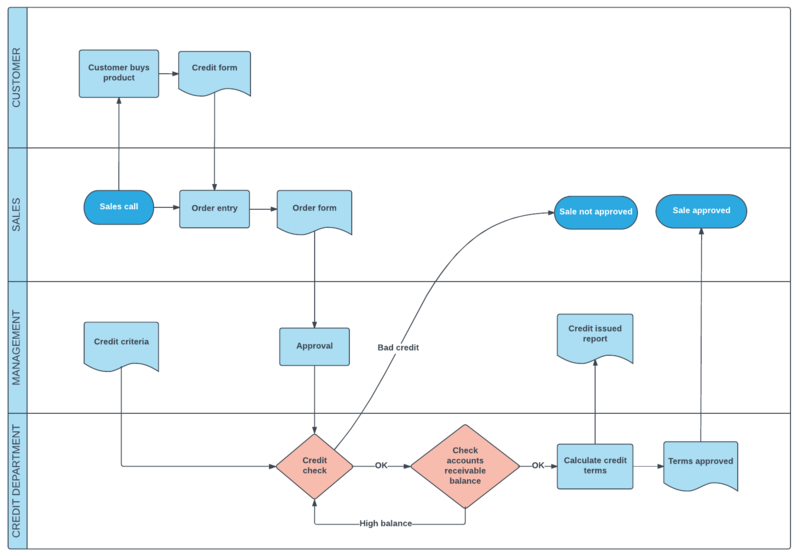 Try Lucidchart for mapping processes and generating buy-in to see the time and money you will save.